Welcome to the Handy Man’s Corner. 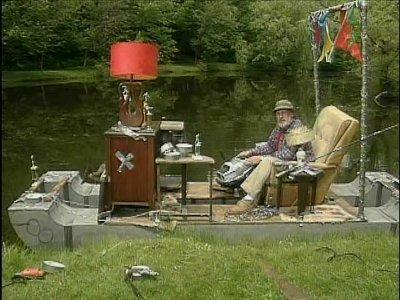 I’m today’s substitute blog-host, Red Green. I heard today’s topic was going to be all about tools. I get pretty excited about tools, even boring things like knitting and crochet tools. There’s something primitive and manly about taking a stick , or maybe even two sticks, and making something with them. Especially when when my wife does it. Personally, I think the next step in the process is motorization. I had all sorts of ideas about how to rig something up using an old boat and a water wheel. Unfortunately, the needles I had rigged up to the water wheel started smacking against each other so hard they threw out sparks and set the boat on fire. My wife got pretty mad at me after that because, you see, we were camping at the time and those were the only needles she brought with her. I told her, “Not to worry,dear. I’ll make you some new needles.” And that’s just what I did. My wife didn’t cotton to the idea of those bumps, so I pulled out my pocket knife and started whittling. By the time I had a needle smooth enough to my wife’s satisfaction, the needles were too short. “You idiot,” my wife scolded. I was about to toss those daggum twigs in the fire when I remembered something. My wife sometimes knits with funny looking, short needles with a cord in the middle. I was fresh out of cord so I set off into the woods to look for a substitute. I came back with a long length of vine, which I had pried loose of an abandoned outhouse. Now, how do you make a set of cord-needles from two short sticks and a vine? 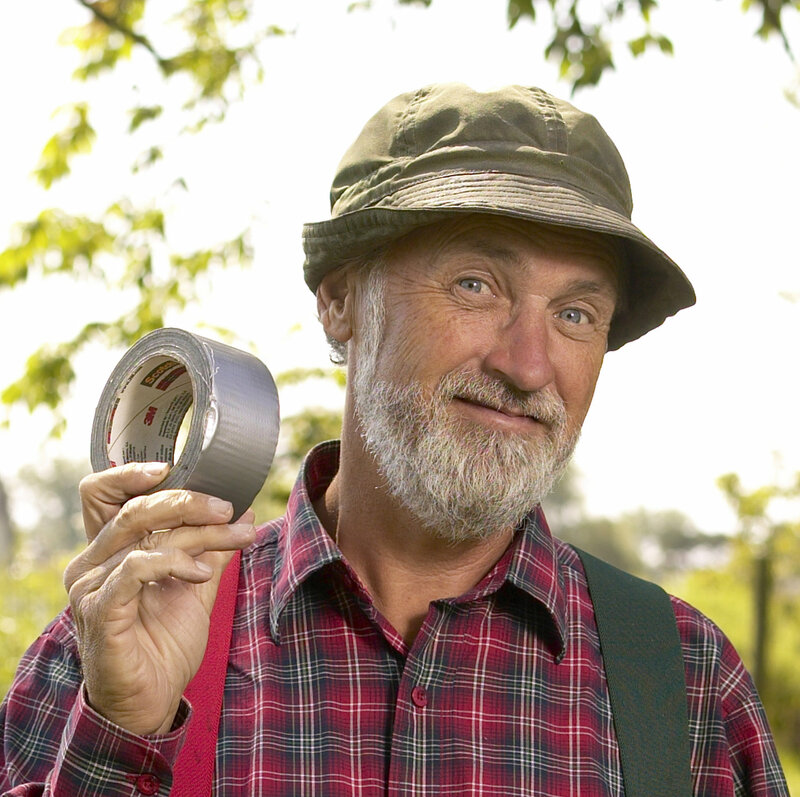 You use the handyman’s secret weapon: duct tape. I lined up the ends of the vine with the ends of the twigs and taped ’em together real good. Problem is, that created a sticky lump. Yarn and dirt are just gonna stick to that. So I added some more duct tape to make more of a tapered lump. My wife complained that the vine was a little sticky and uneven. You can’t really whittle a vine, so I just covered that whole thing with duct tape. Smooth as a baby’s bottom. My wife knitted away the rest of the camping trip. It got so, when one of my Possum Lodge pals came by to talk about shrinking maple syrup yields, she didn’t complain. Didn’t even notice when the raccoon ran off with our steaks. Totally distracted. The best kind of wife is a distracted wife. So that’s it for the Handy Man’s Corner. Remember, I’m pullin’ for you. We’re all in this together. ZOMG GREAT POST. 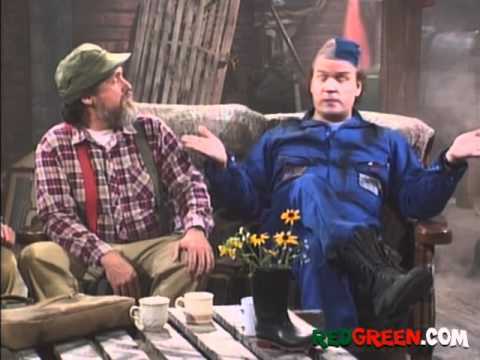 I ❤ Red Green. I somehow keep forgetting your a Midwesterner as well. WELL. You've captured his voice perfectly. Possum Lodge 4EVA. Indeed I am. This was a show my whole family enjoyed. 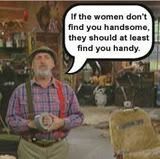 I think handyman’s corner was my favorite segment of the show. It really is a great part. And please forgive my incorrect “you’re” ugh. Ok. Trying to stop giggling and write a comment. I don’t know who Red Green is so I read it in the voice of Russel Coight (All Aussie Adventures) and I think it was just about perfect!!! If the women don’t find you handsome they should at least find you handy needs to be embroidered on a man cushion. I’m pretty sure episodes can be found online. I’ll have to look up All Aussie Adventures as well. I’m sure the tone of the show is similar. I know you enjoy embroidery. I have a sample of yours here in my office. I hope you do make a cushion. 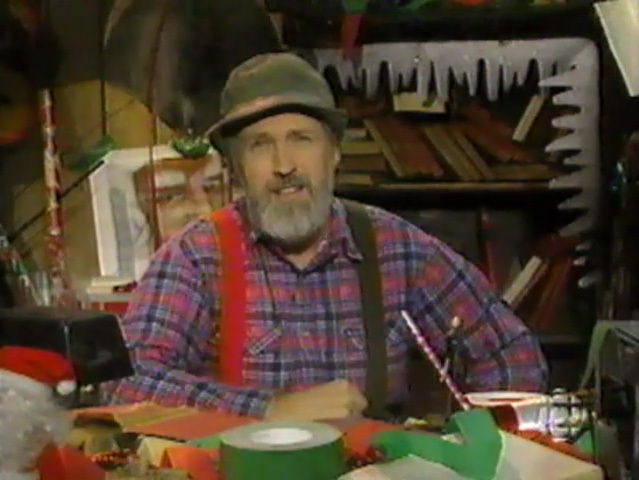 YAAAASSSSS Red Green!!! High fives for creativity! Thanks! It makes me want to go back and binge on episodes. And I totally agree with bekswhoknits, that sentence is worth to be remembered! So thank you. If something’s stuck when it should be moving, use a hammer. Make sure to bring lots of duct tape. I think it’s the primary ingredient in these needles. Our family loves that show, partially because my husband is Red Green all over again.